Western blot analysis of extracts of HeLa cell line and H3 protein expressed in E.coli., using H3K4me1 Monomethyl Polyclonal Antibody. Western blot analysis of extracts of HeLa cell line and H3 protein expressed in E.coli., using H3K4me2 antibody. 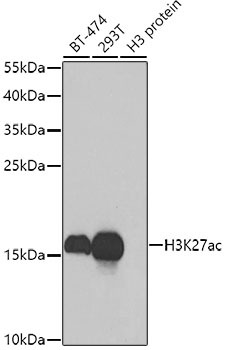 Western blot analysis of extracts of HeLa cell line and H3 protein expressed in E.coli., using Histone H3K4me3 Polyclonal Antibody. Dreval K et. al. (March 2019). HDAC1 negatively regulates selective mitotic chromatin binding of the Notch effector RBPJ in a KDM5A-dependent manner. Nucleic Acids Res.